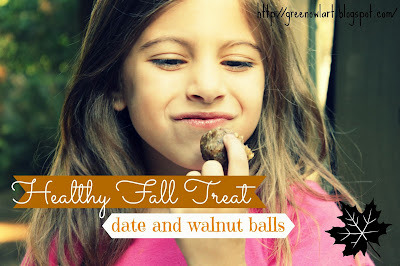 Oh yes, fall has arrived and for some reason it made me think of these yummy date balls that my friend filled me in on last fall. She is my whole food loving, partner in crime and like me is always looking for a healthy treat to give the little ones. Best thing about this-- what you see above is all that is in these sweet fall treats! You need about 1 cup each of dry pitted dates and shelled walnuts. First, measure out a cup each of the walnuts and dates. Emma and I have been talking a lot about measurements as we cook. This recipe was a good chance for her to get some more hands-on practice. Once everything is in the blender, it's your turn to take over for a minute. Get the walnuts and dates processed down to a paste-like texture. It takes a few minutes and a few scrapes with a spoon to get it all fully incorporated. Use a spatula to get the mix out of the blender and let those little clean hands get to work on rolling the mix into balls. Easy-peasy, right? If you have any treats left after your little ones have been eating and rolling, the balls can be stored in the refrigerator. I can't tell you how good these are. 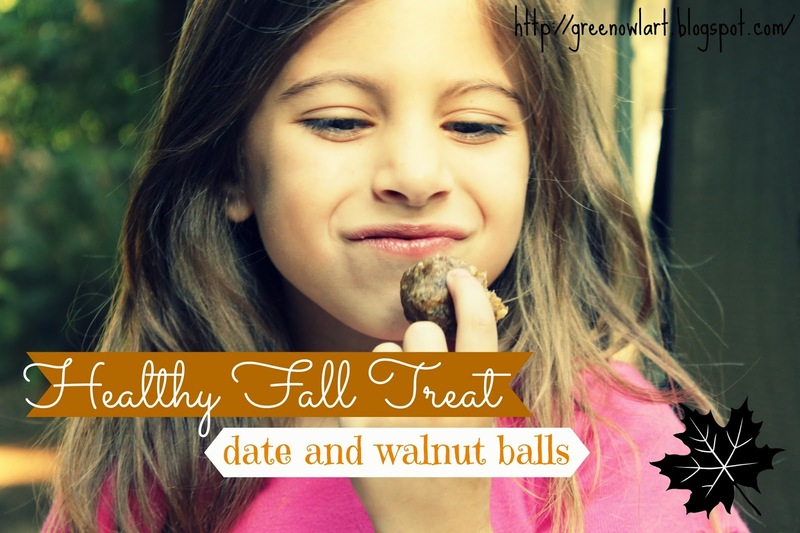 No need for sugar to have a special treat after dinner this fall! Enjoy! I shared this recipe over at Kiwi Crate. Ooh yum, two ingredients I love! These sound delish! Thank you for sharing at our Pinning for Play link party! I've had these before and I could eat them all day!!! (that just might defeat the healthy part of it) Thanks so much for sharing the recipe with After School! YUM! Thanks for sharing at the After School Linky. I'm always looking for new healthy snack ideas!